With each baby bump package you work closely with your artist in order to pick a design that is perfect for your wonderful keepsake. 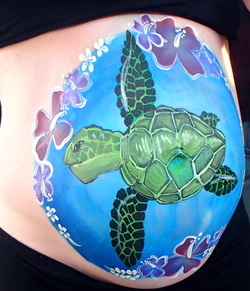 Baby bump paintings are such a wonderful and creative way to showcase your pregnant belly. 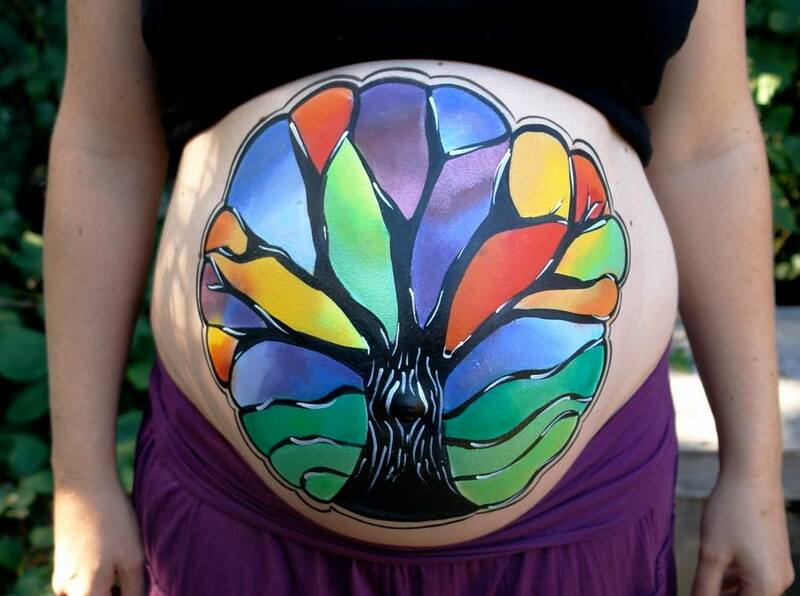 It is very common for women to have photos taken of their beautiful pregnant body, with this option you can choose a design to high light your belly's beauty, with a unique design. Woman may find it to be a great photo to go in their baby's nursery to match a theme, birth announcement, or possibly something meaningful to the expecting couple. Whatever the design may be, it will be personalized and one of a kind, just like your baby. In order to capture your beauty in a way no one else could you have the option of hiring a wonderful professional photographer, skilled and focused on capturing family, maternity, new born and children's photography. You are also encouraged to include your whole family in the photos. Soon to be older siblings tend to enjoy being face painted and included in the earliest of family photos. 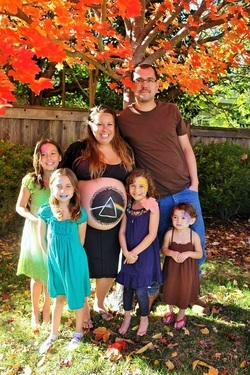 Father's also enjoy being part of your baby bump being showcased. While choosing a design, your artist wants what you want and hopes to find no limits to your imagination. It may take a week or two just to get a design just right and ready to paint. Your artist will send you different ideas, whether pictures or sketches in order to make sure you are both envisioning the same idea. Packages are listed below. Keep in mind these are also amazing gifts to give mother's to be, gift certificates are available. This is a great package for someone who is curious and wanting a simple and beautiful individual experience. 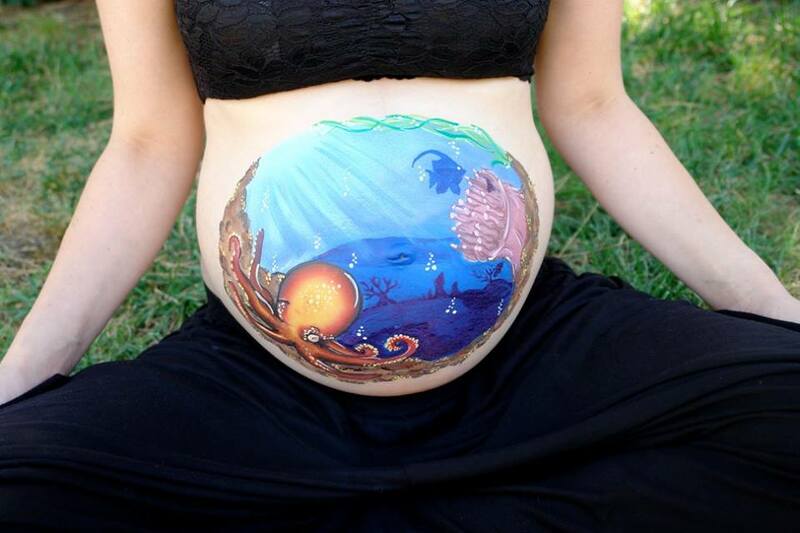 Artist will discuss and work with what type of artwork you are looking for to make your baby bump a beautiful original piece of art. Your artist will then come out to a location most comfortable for you. Painting can take up to 2 hours and artist is always most concerned about your comfort. With this package you will need to arrange for photos to be taken on your own. Your belly would be the only skin painted. Time: 1 hours, if the design becomes more elaborate and requires additional time, your artist will quote you for the time required prior to appointment. Scheduling: This package can be scheduled any day of the week, with more availability during the week days. 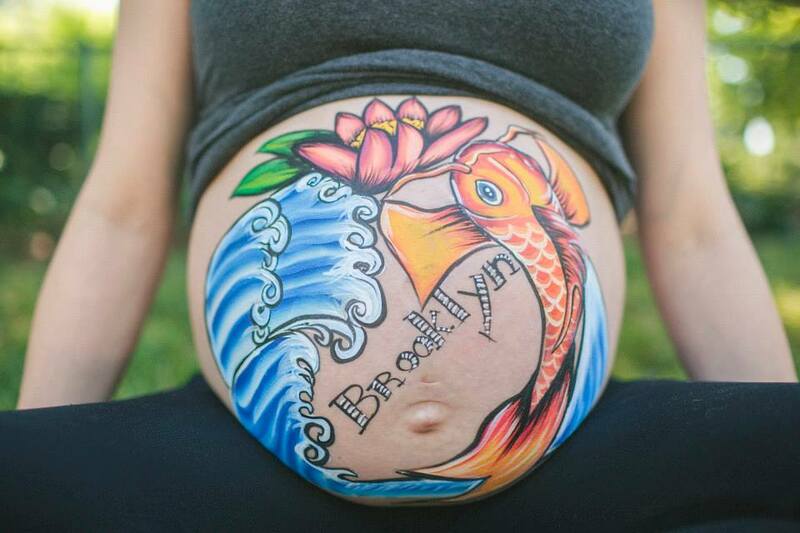 Artists will discuss and work with what type of artwork you are looking for to make your baby bump a beautiful original piece of art. Your artist will then come out to a location most comfortable for you. Painting can take up to 2 hours and artist is always most concerned about your comfort. As the artwork is being finished a professional photographer will arrive in order to take some amazing photos for great keepsakes. You will then receive a cd with 10 hi-res files and printing rights, of your pictures. Time: up to 2 hours, if the design becomes more elaborate and requires additional time, your artist will quote you for the time required prior to appointment. Scheduling: This package can only be scheduled during the weekdays, Monday through Friday. Artists will discuss and work with what type of artwork you are looking for to make your baby bump a beautiful original piece of art. Your artist will then come out to a location most comfortable for you. Painting can take up to 2 hours and artist is always most concerned about your comfort. In addition artist will paint up to 2 other faces, this could be siblings or father or a combination. As the artwork is being finished a professional photographer will arrive in order to take some amazing photos for great keepsakes of you and your family (up to 4 people total) You will then receive a cd with 10 hi-res files and printing rights, of your pictures. Time: Up to 2 hours for the baby bump, in addition 2 faces can take up to 10 minutes total. If the design becomes more elaborate and requires additional time, your artist will quote you for the time required prior to appointment. Our photographer, Danielle Navratil, is award winning and very well known Nation wide, her work has been featured on many web sites and her specialty is natural light. People love her work with new born, maternity and family photos. I am a wife and mother who is fortunate to call Sonoma County home. I love to be outdoors in the sunshine preferably on a beach, to travel, craft, drink coffee (and wine), shop, and to spend my days with my family. My passion for photography really started 5 years ago when I had my daughter ago and has only grown. It is the in between moments, the candid shots, the cuddles between a family and the connections, I believe these are the moments worth remembering. If you want the perfect traditional family photo I might not be your girl, I find beauty in the imperfections of family as they are. To see more of her work please click on the photo below.